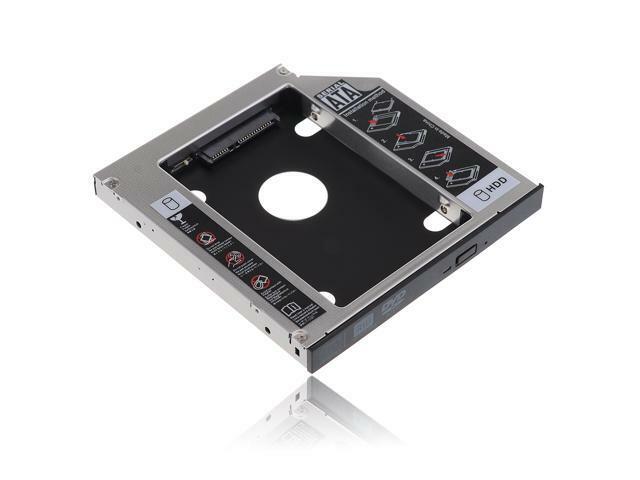 Universal 12.7mm SATA 2nd HDD HD Hard Drive Caddy Adapter For Laptop CD / DVD-ROM Optical Bay, HP, DELL, Thinkpad, Sony, Toshiba, ASUS, Fujitsu, Acer etc. The 2nd Hard Disk Drive Caddy / Adapter to bring you new maximum data storage flexibility, with the compact portable design. Which can work with 2.5" 9.5mm / 12.7mm Serial ATA Hard drive HDD and SSD (Solid State Drive) as well. With the second HDD in your Laptop, You can speed to backup important applications and critical data ( Simply remove your CD-ROM drive and put the Caddy (with the added hard drive) in its place. Easy operation and convenient to use, You will love it! Buy it today! You can't miss it! Dual boot, Support installation of 2nd Operating System on the 2nd HDD and boot selection. Fully integrated into Laptop, no cables / PSU / software driver needed. Fast & Reliable connection just as the primary HDD. The Universal SATA-to-SATA Caddy is compatible with laptops that has a 12.7mm-thick / high optical bay with a SATA interface. External case for 12.7mm Sata DVD drive. Cons: The HDD holder isn't here after 16 and I've got no response from the company after I reported so. Pros: Easy to install Samsung 860 Evo has screws to hold in place. Comes with small screw driver which works on laptop to remove dvd romantic drive. Other Thoughts: Just double check that it's the size you need for your laptop model to avoid ordering wrong one. Pros: did the job at a great price after modification..
Cons: had to remove plastic face plate to make it fit!! my thinkpad t420 has a slopping lower edge which did not match the caddy. the face plate just pops off no tools required.. not a real problem to do but not a perfect replacement and not as decortive without the face plate.. I didn't care as was only using to make a clone hd drive. Other Thoughts: the description should acknowledge the problem and tell you how easy it is for a temp. fix!! Other Thoughts: Terrible. Poorly made and designed, not a ideal caddy at all. Besides the tincan outside it has more screws then the laptop itself. Does not fit universal. Can not take apart to makeshift to make fit.